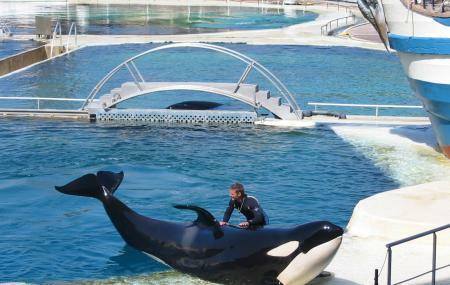 Marineland is considered as the biggest marine park in Europe. The park allows you to have close interaction with dolphins, killer whales, and also sharks, sea lions and other deep water inhabitants. In a designated pool with the supervision and advice you get a chance to meet dolphins or sea lions. Combination ticket prices vary with validity. Combined tickets for Marineland and Aquasplash with 2 day validity are available. Other activities like meet the dolphins meet the sea lions, meet the sharks, accompanying adult for the activities, dinner show, dinner with the killer whales and VIP visit have extra charges. Discounts are available on early booking. People normally club together Garoupe Lighthouse and Juan Les Pins Main Beach while planning their visit to Marineland. Wonderful place for a family outing,being up close with the killer whales,playing soccer with the sea lions and the playful nature with speed of the dolphins and expertise of the trainers and performers. Sure a nice place to visit in France. Something awesome. I saw some similar parks in USA in movies and I was dreaming that I would like to see some similar park in the future... I found this during our vacation in Nice and we really enjoy the day at Marineland. It is not only funpark with marine animals but you can learn a lot about enviroment. Entrance fee is OK, prices in shops too... It was a really nice experience and I hope I will came back with my kids in the future. LOVE IT!!! A theme park which has a different species of water animals presenting shows of killer whales, dolphins, polar bears etc.. has an aquarium with a variety of fishes. Nice park to spend a day out with family and lots of kids areas inside the park. We had a great time in Marineland in January. We followed one person who is part of the scientific staff. Her presentations were quite interesting and very lively. Cherry on the cake the park was not crowded at all and the weather was mild. We went to the park in the summer but the experience was not so good. There were too many people and we could not enjoy the interactions the same way. Anytime it is a magic place for the children.